Chia seeds, whose botanical name is Salvia hispanica, are also known as Spanish sage. These seeds which are obtained from a flowering plant of the mint or Lamiaceae family, have been used since the time of the Aztecs as a medicinal food. Chia seeds reduce levels of the bad LDL cholesterol and boost those of the good HDL cholesterol. They also prevent cancer and have even been proven to reduce high blood pressure. Chia seeds contain polyphenols like chlorogenic acid, kaempferol, myricetin and quercetin and which are all antioxidants (1). Caffeic acid is another antioxidant polyphenols found in these powerful seeds (2). The antioxidants are some of the most potent since they have an ORAC value of 10,000 vitamin E equivalents. They are therefore able to reduce the harmful effects of the chronic inflammation that characterizes Candida colonization. Chia seeds also contain a good amount of essential fatty acids with 1 oz or 30 grams providing around 6000 grams of omega 3 fatty acids. These also reduce inflammation in the body and can help control the inflammatory effects of a Candida infection. Chia seeds are good sources of protein with 100 grams providing around 25 grams of protein (1). In addition, they are complete proteins since they provide all the 9 essential amino acids. As a plant based complete protein, chia can be an integral component of the Candida Diet for those that are avoiding meat, since many meats are laden with antibiotics, or for those that are vegetarian. Chia seeds are a good source of fiber with 100 grams providing around 37.5 grams of fiber (1). This fiber aids bowel regularity and can reduce the constipation associated with Candida overgrowth. In addition to removing wastes from the body, chia seeds form a gel which binds toxins in the gut and aids their removal from the body. This helps keep the body in a balanced state that reduces overgrowth of this yeast. 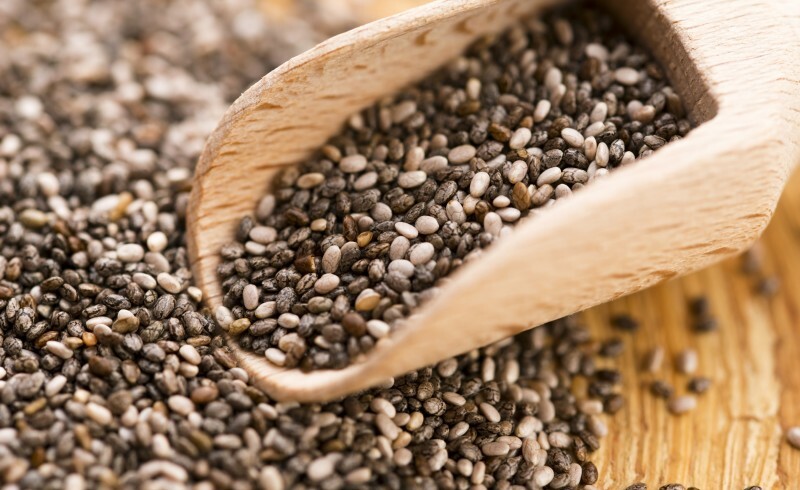 The fiber in chia also helps regulate the absorption of blood sugar. By maintaining steady blood glucose levels it helps control Candida which feeds on the sugar. In addition, the steady blood glucose levels also reduce sugar cravings and this makes chia seeds very beneficial for persons who crave sugar as a result of a Candida infection. The word “chia” is from the Mayan civilization and it means “strength” since these seeds were good sources of energy. A study confirmed these claims and found that consuming chia seeds enhanced the endurance of athletes engaging in workouts that lasted for more than 90 minutes (3). This effect can be beneficial for reducing the fatigue that is associated with Candida overgrowth. Chia contain compounds known as lignans which are said to have antifungal properties and they may therefore contribute to controlling Candida. The suggested chia seed dose is 2 tablespoons per day for adults and 1 for children aged 4 ½ years and above. To reap these healing benefits, buy good quality seeds and then ensure that you grind them before consuming them to make their nutrients readily available for digestion and assimilation. Ground chia seeds can be added to cereals and salads. Since they form a gel when mixed with water and take on the taste of the foods they are mixed with, these amazing seeds can also be used to thicken smoothies, sauces and puddings. Consuming chia powder made from germinated seeds is a great option since during the germination phases of growth plants contain more concentrated amounts of nutrients and enzymes. In addition, these nutrients are easier to absorb from the powdered chia. Persons taking the blood-thinning medication warfarin (Coumadin) should not take chia seeds since they can interact with the medication. Those taking high blood pressure medications should use them cautiously since they can also lower blood pressure. Persons with constricted esophagus or intestines should consume them after consulting their doctors since they can absorb more than 10 times their weight in water. This consideration should also be kept in mind when adding chia seeds to food for children.